Today we received a shipment of guitars from China. Inside these boxes are some of the instruments that I've been developing in the factory that I'm working in there. My son Simon had to load them into a corner of the workshop. Our place isn't huge, so we'll be unpacking them slowly, but the ones we've seen so far are quite nice. These are mostly student guitars, and excellent for their prices. One of the models, the ESTUDIO 45, uses bubinga back and sides, and it is quite beautiful. It reminds me of the palo escrito I used to work with in Mexico. We have a few of these unpacked. Presently we have both cedar and spruce top models available. They feature solid tops. These guitars will list at $695.00. Until July 20th we'll discount them to $595.00 as long as the supply lasts. As an inaugural posting to our new blog, let me catch up to speed on our move and our new location. 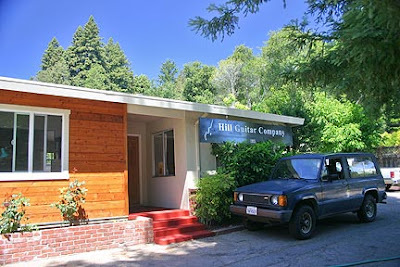 A little less than a year ago my wonderful wife Roberta encouraged me to try to buy the building that Hill Guitar had rented for the previous seven years. After hard negotiations I couldn't make a deal, but in the course of things I started looking around and finally found and purchased the place the we are in now. We began the prolonged process of packing, re-organizing and moving sometime last September, and though we took possession of the place at the first of this year, we are still arranging, remodelling ad reorganizing to this day. I think it will go on in a serious way for several months more. The new place is perfect, and very unusual. It is a commercially zoned residential building in Ben Lomond, located on California State Highway Nine, about 8 miles outside of Santa Cruz. We are in the coastal mountains, but only 10 miles from the Pacific Ocean. It's 1 1/2 hours south of San Francisco, 40 minutes from an Jose, and 3/4 mile from my home. It's couldn't be better. Find directions to get here. The living room of the house is now the guitar showroom, and it's a great place to try guitars. We aren't really a guitar store, but if you make an appointment we usually have some nice guitars to try. The guitar workshop itself is much smaller than the old place, but it is perfect for producing a small number of very high quality guitars. And that's exactly what we're doing. I've spent the past couple of weeks building a shed for wood storage. It is a cedar building that is insulated and climate controlled to keep our wood stock in good condition and easily accessible. Doing the building was a good opportunity to work up a sweat and to absorb some of our delicious California sunshine, as well as to completely go through the inventory of woods that we'll use to make our guitars over the next few years.The beautiful look, feel and smell of these exotic woods is one of the great payoffs for being in this business. It's also one of the biggest expenses. We've been focusing on Signature Models these days, and have recent sent some off to some of our dealers, including Rosewood Guitar in Seattle, Kirkpatrick Guitars in Baltimore, Bentley Guitar in Kansas City, Maple Street Guitar in Atlanta and Musik Jellinghaus in Dortmund, Germany. If you haven't tried a Hill Signature Model yet, please do! Contact one of these dealers and play one. They usually don't last long. I'll keep it short for now. Tomorrow I'll walk around and shoot some pictures. Look through the photo tour of the place, and feel free to contact us for an appointment if you want to come by. It's a guitar oasis, and definitely an interesting field trip. I just love it. Using the blog, we hope to bring you information faster than we have through our email newsletters. We've got plenty of news, not the least of which is our new location in sunny Ben Lomond, California.